The Institute of Precision Mechanics implements a policy that ensures high quality in all of its activities. The quality policy and objectives defined for the quality management system are consistent with the strategic direction of the Institute, and they are designed to meet the needs of the clients and other parties and maintain their confidence. The IMP implements the quality management system in accordance with PN-EN ISO 9001:2015.
business licence issued by the Ministry of Interior and Administration No. B-077/2007. 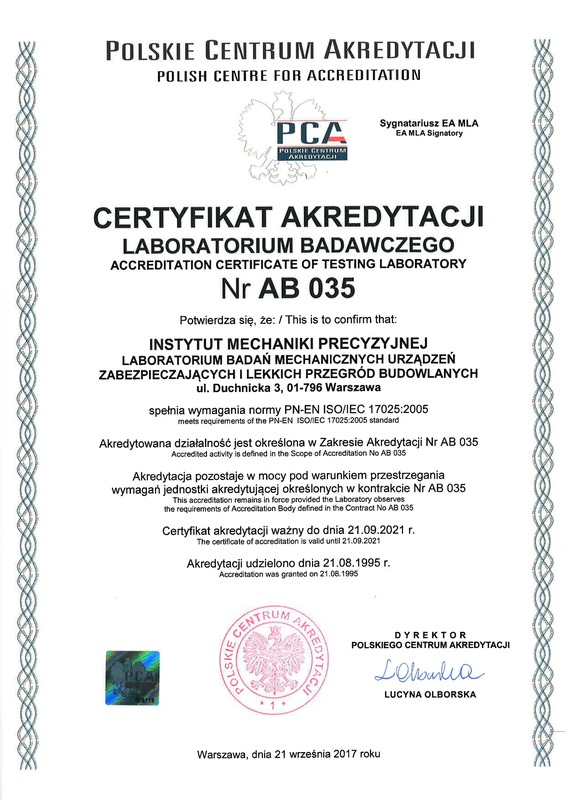 Laboratory for Tests of Mechanical Security Devices and Lightweight Space Dividers – accreditation certificate received in 1995. 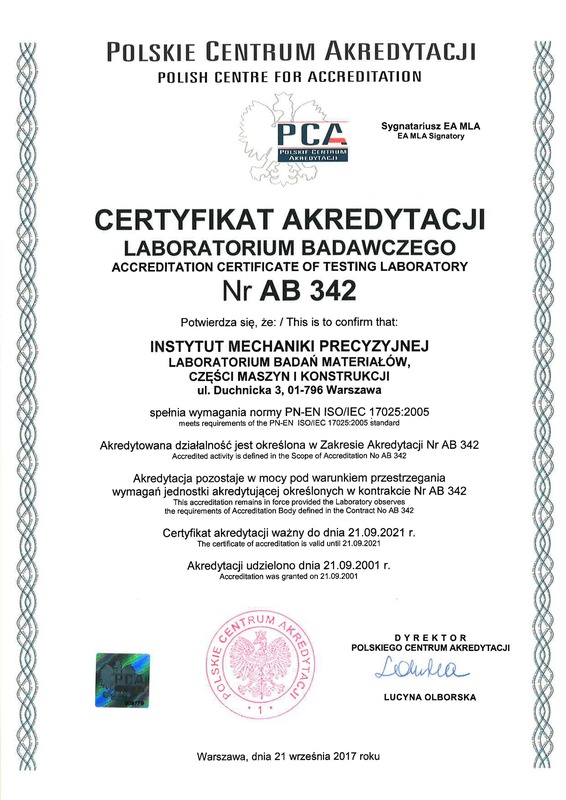 Laboratory for Tests of the Properties of Paints and Coatings – accreditation certificate received in 2003. Laboratory for Testing of Materials, Parts of Machines and Structures – accreditation certificate received in 2001. The high quality of the testing laboratories of IMP was certified in 2017 during the re-assessment conducted by the PCA, where the laboratories were accredited until 21/9/2021. 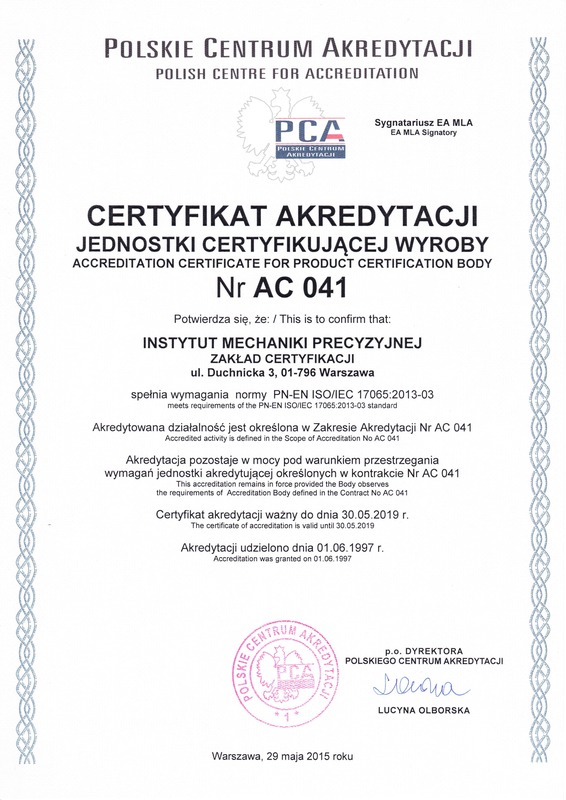 The Certification Facility of the IMP functions as a Product Certification Body and has an accreditation certificate issued by the PCA for conformity to PN-EN 17065:2013-03. The IMP received its first accreditation in 1997, and the current certificate is valid until 30/5/2019. The facility certifies mechanical security devices, construction products and other products related to the statutory activities of the Institute. The declared quality policy is based on the close cooperation between all personnel of the Institute. Continual development and improvement of the quality management system is regarded as personal commitment of the management and all personnel of the IMP.